Wind Whistling in Overhead Wires is a collection of field recordings and outtakes from my work on Jacqueline Goss’s film The Observers. This is a pay-what-you-wish (starting at free! ), digital download release on Bandcamp. I made the field recordings during our two amazing shoots at the top of Mt. Washington in New Hampshire (see these previous posts). I processed some of the sounds using custom effects developed with Cycling 74’s Max software and added a few instruments in the studio. I chose my favorite sounds and sketches that didn’t make it into the final film and sequenced them to create a continuous 20-minute piece (though some of the tracks work well on their own, particularly Downslope Flow). Enjoy! Jacqueline Goss’s film The Observers has a one-week run at Anthology Film Archives. Thursday May 10 – Wednesday May 16, at 7:00PM and 8:45PM each night. It’s paired with Jesse Cain’s short film The Lakes. I did the sound and score for The Observers and am excited to see it again on the big screen. I’ll be releasing the soundtrack for the film very very soon. Stay tuned! 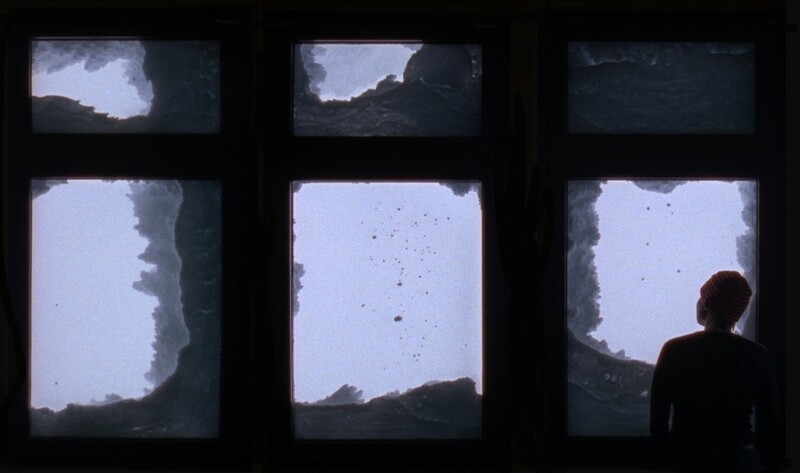 Jackie Goss’s film “The Observers” is being given its New York premiere at Anthology Film Archives as part of the Migrating Forms festival. The screening will be Sunday, May 22 at 2pm. The land and sky of Mt. Washington, New Hampshire form a frame for a meteorologist as she goes about the solitary and steadfast work of measuring and recording the weather. 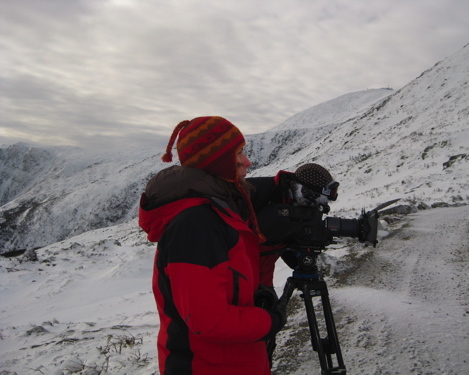 Inspired by the Nathaniel Hawthorne story “The Great Carbuncle,” this film features the extreme and varying beauty of the windiest mountain in the world. 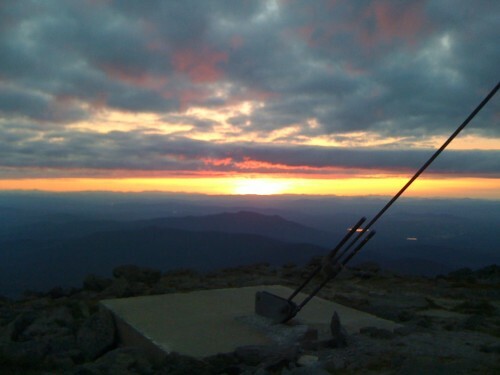 Shot on 16mm film over the course of a year, “The Observers” is based on the actual work of the crew of the Mount Washington Weather Observatory — one of the oldest weather stations in North America where staff members have taken hourly readings of the wind speed, visibility, barometric pressure, and temperature since May 1932. 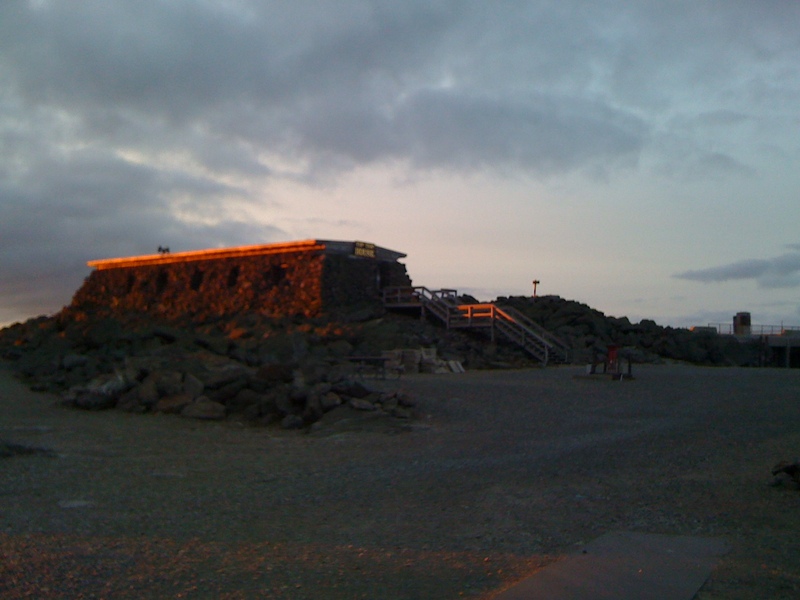 In 1934, the staff measured a wind gust of 231 mph, which remains a world record for a surface station. I’ve been privileged to be part of the production of “The Observers” along with Jesse Cain, Dani Leventhal, and Katya Gorker. I posted here, here, here and here about our experiences shooting at the top of beautiful Mt. Washington, NH. Since then I’ve composed music for the film, assisted Jackie with recording foley and worked on sound design. This has been a great project! “The Observers” screened on the closing night of the Crossroads Festival in San Francisco, and will be shown again in early June at the Chicago Underground Film Festival. I’ll post details when I get them. 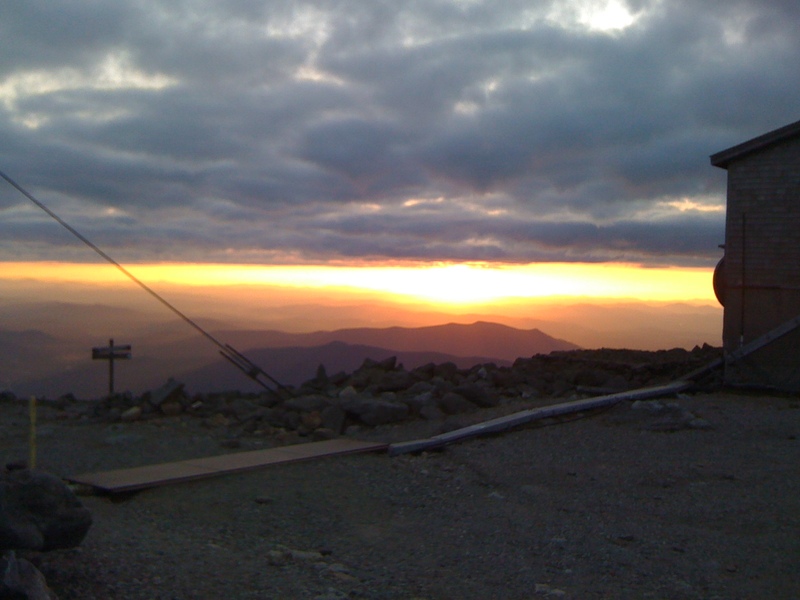 Here are some photos of the sunset during the recent Mt. Washington shoot. Sounds will be coming soon! I’ve just started the summer portion of the Mt. Washington film shoot. I hope to write more later about how the mountain is different in the summer than the winter. 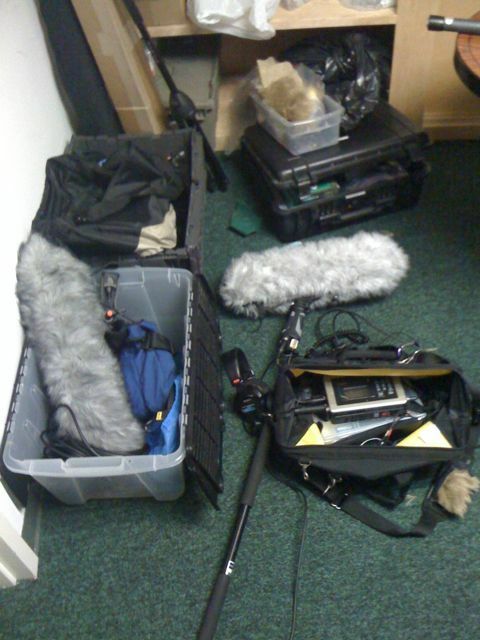 Here’s a photo of my audio gear in the corner of an office that was very kindly provided for our use. 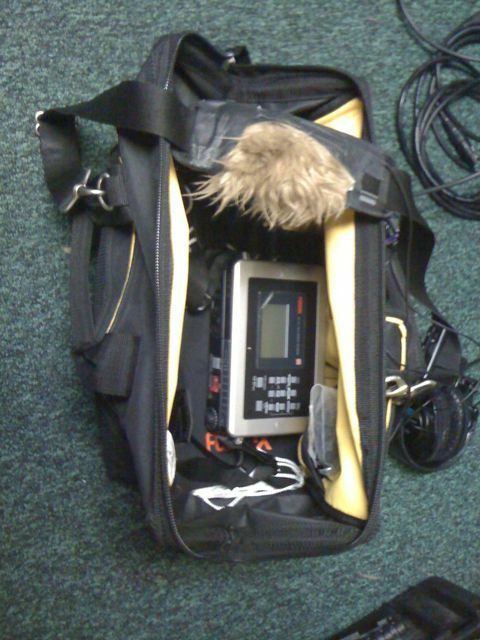 It’s followed by a shot showing the omni mic I rigged onto the strap of my recording bag. I was hoping to have a true Mid-Side setup this time around but couldn’t get the figure-eight mic I needed. This setup isn’t ideal but it gives me a different perspective on everything I record. (I’ve got two inputs on my recorder so might as well use them both.) The brown fuzzy is a DIY wind screen made from fake fur. A foggy day with visibility down to 1/16th of a mile. The observatory reported zero hours of sunshine for the day. Perfect conditions for rime ice. 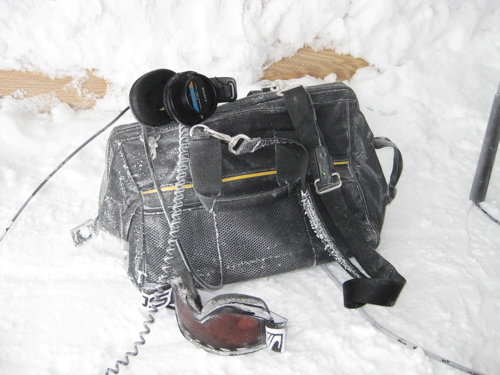 We could hardly step outside without it accumulating on our clothes and, of course, our gear. 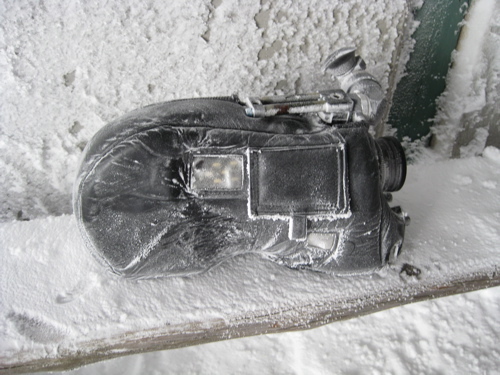 My recording bag covered in rime ice. My headphones were unscathed since I wore them under my balaclava (and hat (and parka hood)). Listening to the entire recording one can clearly hear the frequency of the resonant ping sounds increase as more ice accumulates. I suspect the ice accumulation reduces the surface area of the contact mic or otherwise stiffens the transducer–in a manner similar to a drummer increasing the pressure on a drum head and thus causing the pitch to rise. Here’s a recording of an ice-covered chain squeaking in the wind. The squeak is less metallic than I expected, sounding more like rubbing ice cubes together. Here’s a photo of the chain (taken on another, much sunnier day). Yes, this chain appears to be preventing the building from blowing off the mountain. The story I heard is that the chains were an important part of the original building. When they rebuilt the structure, chains were included as an historical and decorative element. There were times when I could have used a chain or two to prevent me from blowing away. 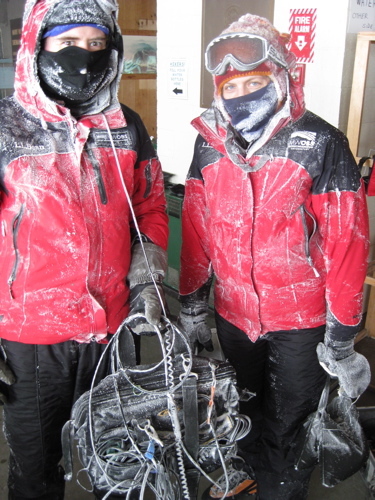 Jackie and I covered in rime ice after our contact mic recording expedition. I’m back home from the Mt. Washington shoot where I was so busy I never posted any updates. So I’ll be posting news of the trip many days late. 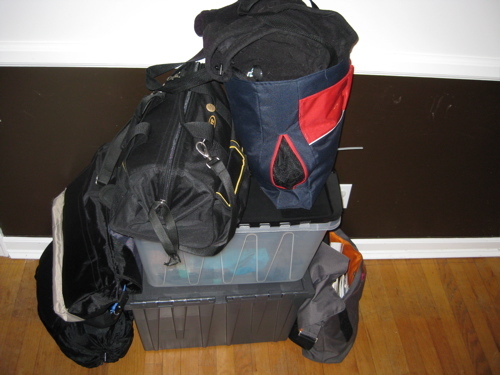 Here's all of my audio gear packed up and ready to go. 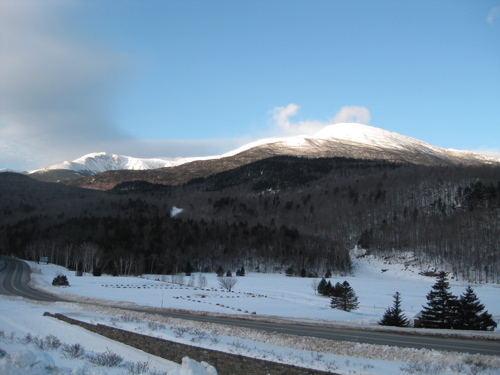 January 9: We all gathered at Jackie’s house, threw our gear in the van and drove to New Hampshire. Jacqueline Goss was the leader of the crew: video artist, writer, director, producer. Jesse Cain: cinematographer. Dani Leventhal: talent. (She hates that word, but after spending the better part of a week together I think it fits just fine.) We spent the first night enjoying the comforts of the Appalachian Mountain Club Joe Dodge Lodge. Jesse unpacked and assembled the camera so we could begin shooting first thing in the morning. January 10: First thing in the morning we met our ride up the mountain (snow tractor!) at the Auto Road and took a minute to shoot a few establishing shots. On the way to the summit we stopped just above the treeline to shoot a few more scenes. I loved seeing the stunted krumholtz trees that are just visible in the lower left corner of this photo. Late morning, we arrived at the summit and quickly unloaded our equipment. Visibility was good, and since we didn’t know whether we’d get clear skies again Jackie and Jesse and Dani peeled off to shoot some scenes that didn’t require sync sound while I took a look around the observatory and organized our gear. Here’s an excerpt from the first day of recording; a scene where Dani knocks the rime ice off a sign. These sounds are indicative of winter weather on the mountain: wind envelopes everything, so even rather violent actions produce only faint tinkles of ice. I’m headed to the top of Mt. Washington in about a month. I’ll be recording audio for an experimental documentary project led by Jacqueline Goss. At Jackie’s request I’ve been reading material on the history and operation of the Mt. Washington Observatory. I’m already having fun geeking out about cloud cover and wind speed and fog and rime. Still trying to figure out how to actually record usable sound in 50mph wind… I’m currently building a handful of DIY contact mics/hydrophones in anticipation of recording ice accumulation and the straining of various summit structures in full-on gales. I’m also building a few electret omni mics so I can have something to take outside with impunity in the worst conditions. I’ll try to post some photos of my homebrew audio projects. 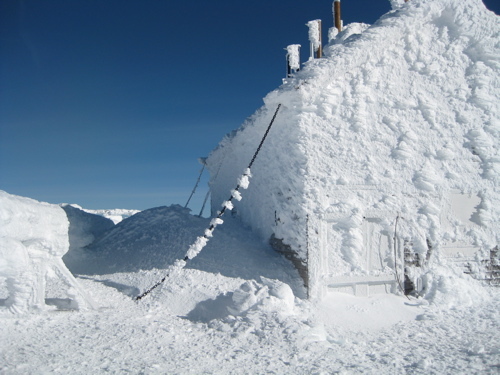 Also look for future reports and audio samples from the mountain top.